This course is aimed at Ph.D. students and advanced M.Sc./Diploma students. It is not a basic course in particle physics, a topic with which the students will be assumed to have some familiarity. 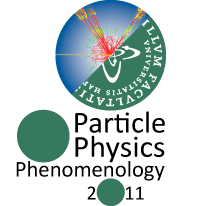 The intention of this course is to give an overview of the main theoretical physics concepts that underlie our understanding of high-energy collisions, specifically proton-proton collisions at the LHC machine. To be more precise, the emphasis is on QCD aspects of collisions, which by necessity enter in all processes at a hadron collider. It is complementrary to other Nordic schools, such as the recent Odense one on BSM physics at the LHC and the upcoming Ph.D. course in Copenhagen on Advanced methods in statistical data analysis. Introduction and overview. Monte Carlo techniques. Evolution equations. Final-state radiation and showers. Parton Density Functions. Initial-state radiation and showers. Matching of hard matrix elements to shower descriptions. Multiparton interactions, minimum bias and underlying events. Hadronization physics, especially in the string model. Jet physics. Jet algorithms and other event properties. Event generators and related physics software. Tunes to data. Applications to processes within and beyond the Standard Model. Main lessons from the LHC, open issues, summary and outlook. The lectures are interspersed and complemented by exercise sessions, with both analytical and computer-based tasks. These tasks will require the students to run some software on their own computer. This page will reflect the list of prerequisite software as it becomes available. We encourage everyone to utilize their own travel budget. However, we do have some money for travel support. Please get directly in touch with the organizers if you think you might need financial support.